There is very little doubt that an openly gay candidate for the U.S. Senate or House of Representatives would win an election in notoriously anti-gay Arkansas or South Carolina. However, in the case of freshman Arkansas Senator and Tehran's new "pen pal" Tom Cotton, a former Army Ranger who served in Iraq and Afghanistan, and his major supporter, Senator Lindsey Graham of South Carolina, an Air Force Judge Advocate General reserve officer, the Republicans have quite stealthily moved two closeted homosexuals into the U.S. Senate from both states. WMR covered Graham's closeted status in our March 26, 2010 report: "WMR was recently told by South Carolina-based journalists that they are amazed that South Carolina Republican Senator Lindsey Graham's homosexuality has not been reported in Washington. Graham is also one of the beneficiaries of President Obama's overturning of the 'Don't Ask, Don't Tell' policy that now permits gays and lesbians to openly serve on active duty. Graham is a Judge Advocate General Colonel in the U.S. Air Force. In 2004, Graham voted for the Federal Marriage Amendment, which prohibited gay marriages. Graham has recently received a zero rating from the gay rights Human Rights Campaign for his opposition to gay rights legislation." It should be added that one of the South Carolina journalists who passed on the information about Graham worked for The State newspaper, Columbia's paper-of-record on South Carolina politics. Now comes word that Cotton, who has called for the arrest and prosecution of journalists who "leak" national security secrets even though he once wrote for the Harvard Crimson, is a frequent customer of JR's, a well-known gay bar in Washington, DC's primarily-gay Dupont Circle neighborhood. Questions are being raised about "Tehran Tom" Cotton's [left] off-duty exploits in Washington, including his being a frequent patron of JR's, a Dupont Circle gay bar [right]. Cotton joined the U.S. Army in 2005. He graduated from Harvard Law School in 2002 where one of his law professors was Elizabeth Warren, who now serves with him in the Senate as a senator from Massachusetts. The GOP, especially its Southern branch, generally runs short on bona fide veterans to run for political office. In order to compensate for its lack of veterans, the party grooms people like Cotton and Graham to earn some military gravitas before they are put on the fast track for the U.S. House and then the Senate. The military service record is essential for the Republicans in order to compensate for the "gay" rumors that swirl around some of the party's political recruits. After serving a short tour of duty in Iraq, Cotton was transferred to The Old Guard at Arlington National Cemetery, known for its provision of model soldiers for guarding Arlington Cemetery's Tomb of the Unknown Soldier and providing troops for the funerals of deceased veterans. Cotton then served two tours of duty in Afghanistan before he was discharged at Fort Myer, Virginia, across the Potomac River from Washington. Cotton's military service propelled him into the U.S. House in 2012 and in 2014 he was elected to the Senate, defeating incumbent Democrat Mark Pryor. Cotton has come to the public's attention as the author of the letter to Iran's leadership informing them that any P5+1 nuclear agreement with Iran will be terminated the minute President Obama leaves office. Although 46 Republican senators plus Louisiana Governor Bobby Jindal signed Cotton's letter, some of the signatories expressed remorse for doing so after newspaper editorials around the country condemned the action. Rumors about Cotton began swirling during his race for the Senate when it was discovered that the Cotton campaign was running political ads on GRINDR, a smart phone application for gay men looking to hook up with other gay men. Cotton had earlier received the endorsement of the National Organization for Marriage because of his anti-gay marriage stance. And speaking of marriage, there is the curious rushed wedding of Cotton in March 2014 during his Senate campaign. Cotton married Anna Peckham, described at the time as a Republican lawyer who was only seen once with Cotton at a Washington event in 2013 sponsored by the neo-conservative American Enterprise Institute. With no announcement of a prior engagement or any details about Peckham, the Arkansas media reported that Cotton married Peckham over the March 15, 2014 weekend. Cotton's House office refused to provide any details about Peckham or the wedding, not even the bride's full name or the location of the wedding. The rumors that Cotton had to arrange a quick marriage to a "beard" in order to cover up his gay life style immediately began circulating in Arkansas and Washington, DC. Cotton's "quickie marriage" was all the more peculiar since he had written of his support for the concept of "covenant marriages," which had been adopted into law in Arkansas due to the efforts of Governor Mike Huckabee in 2001. Cotton words of "covenant marriages" were: "Couples who choose a covenant marriage undergo counseling before they marry and can divorce only with fault, defined as abandonment, physical abuse, adultery or conviction of a capital crime." But where was Cotton's pre-marital "counseling" before he married Peckham? Did he only advocate "covenant marriages" for others but not for himself? "U.S. Rep. Tom Cotton was married this weekend to Virgina attorney Anna Peckham, according to his office . . . The wedding took place Saturday (March 15) at a small ceremony with family and friends, said spokesman David Ray. The location is being kept confidential, Ray said. Peckham will take the congressman’s last name and be called Anna Cotton. The couple will take a short honeymoon during the congressional recess and ultimately live and raise a family in Arkansas, Ray said. Cotton’s wife grew up in rural Nebraska and met him at a lunch that she attended 'at the encouragement of a mutual friend,' Ray said. The two have been engaged since 2013." Cotton was reportedly a frequent customer of JR's between his election to the House in 2012 and his marriage in March 2014. 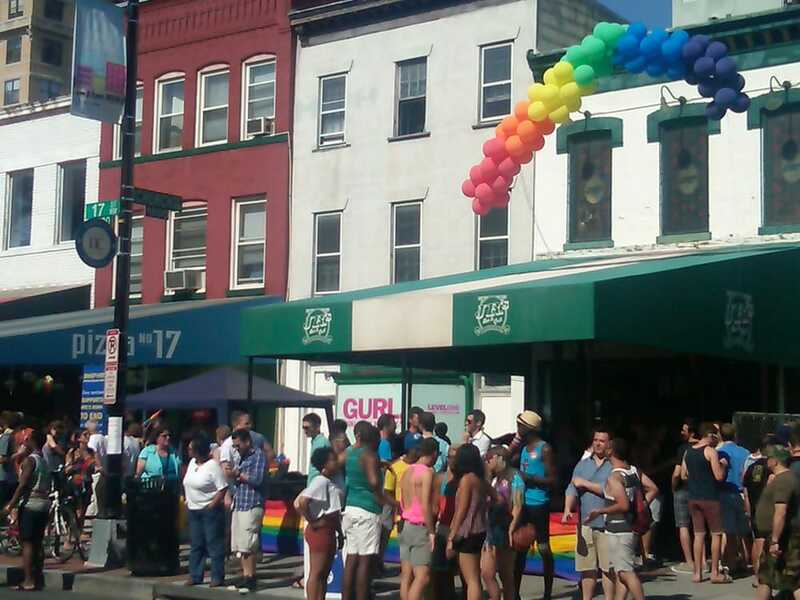 It is not known whether Cotton frequented DC's gay bars when he was assigned to the Old Guard, however, many of the clientele of gay bars in Dupont Circle and in southeast Washington along the Pennsylvania Avenue corridor close to the Marine Barracks and the Washington Navy Yard are active duty enlisted men and officers. JR's is popular with gay men because the bartenders, who even attract straight women because of their looks, are known to go shirtless in the evening. Some of the bartenders are known as "bears" because of their hirsute chests. The most popular entertainment JR's offers is on Monday nights when Broadway show tunes are the de riguer. Perhaps the White House should adopt as its theme song, Oscar Hammerstein's "I'm gonna wash that man right out of my hair," in response to questions about Cotton's letter to the ayatollahs of Iran.